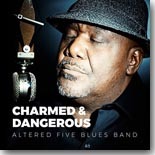 Our reviewer describes the music of Altered Five as 'heady mix of of powerful modern blues, deep soul and classic R&B', with their first CD, Charmed & Dangerous, on Blind Pig making the cut as this month's Pick Hit. The move from Colorado to Austin, Texas was a good one for guitarist Brad Stivers, as he blends a whole lot of different styles and influences on his Vizztone release, Took You Long Enough. It's our Surprise CD of the month. While most of the recordings on Feet Back In The Door from Johnny Ray Jones were cut recently, the whole project had its origins in 1995 with one of the songs included from that session. That's close enough to a Flashback feature for us! Our What's New section features new CDs from Rick Estrin & the Nightcats, Wee Willie Walker, Billy Price, Lightnin' Willie, The Jon Spear Band, Mr. Sipp, Casey Hensley, Tucci, The Halley DeVestern Band, Karen Lovely, and more.